This year’s Agent Reboot show tour is coming to a close next month, but we have a few tickets to give away to make sure you get a chance to go before it’s over. For real estate professionals looking to up their game in technology, these events are not to be missed. 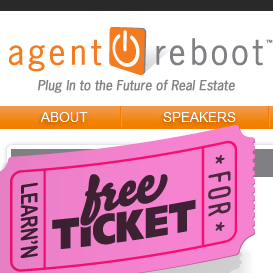 Agent Reboot is a one day conference jammed with discussions and presentations covering how to make social media, mobile, video, and blogging work for real estate agents. With products like our WordPress IDX plugin and new mobile IDX, Diverse Solutions is a big supporter of using technology to grow your business, so we’re happy to partner with Inman News to bring you Agent Reboot! The next stops on the Agent Reboot tour are Boise, Boston, then Tampa, and we have tickets to give away in each of the upcoming cities. Just fill out your name and email on our contest page to enter to win free passes to an Agent Reboot near you! We’ll notify winners via email about a week before each show. You can read more about Agent Reboot, including a full list of upcoming cities, on the Inman News website.